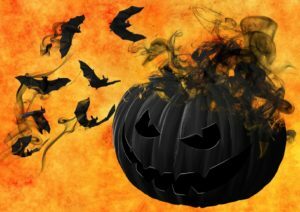 October, the month of beautiful colors and preparing the harvest is shrouded by month long commercialization of the demonic celebration of Halloween, Satan’s holiday. The origins of Halloween comes from the Babylonian Empire; from Baal worship. Mankind turned to worshipping creation instead of the CREATOR! Assyrians developed a system of sun worship. France, Britain, & Ireland developed a sun god called SAMAHAIN, who was appeased with human sacrifices conducted by their priests. They would eat the human flesh of the sacrifice. When Britain was conquered by the Roman Empire in AD 52, Caesar issued a ban on human sacrifice. But they continued their demonic rituals in secret through the centuries. Be deceived no longer! Trick or treaters represent evil spirits demanding a sacrifice of food under threat of being cursed. Making pumpkin lamps to defend yourself against demon spirits is witchcraft! Be not ignorant any longer! Parent, you’re indoctrinating naive children with the principles of Baal worship. Halloween is not just “harmless” fun. Set an example to your children. Read to them the afore mentioned Bible verses. Explain the verses; they are easy to understand. Time to put this annual celebration in the trash! Time to wake up to the truths of this evil celebration…..and come to Liberty Christian Fellowship Church this Sunday…..where the light of truth will disinfect any falsehoods you’ve been believing. Now that’s liberating!